I'm in route to the US Olympic trials and I certainly didn't make it this far on my own! 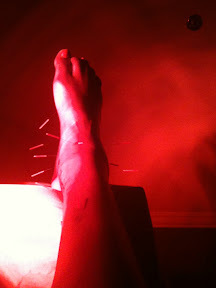 My ankle has been hooked up, probed, rubbed, shocked, and pricked by more machines and magic medicines than I can count. My good friend, James, suggested that I give a little blog summary of some of my efforts. Getting me to the Olympic Trials has truly been a team effort. They say it takes a village to raise a child, but it takes a village plus a whole lot more to breed an athlete... especially one on the mend from a serious injury. I began using Vasper just over a month after my injury last year. I whole-heartedly attribute the bulk of my return to the track to Vasper. Vasper gave me the ability to exercise when I could barely walk. So what is Vasper? 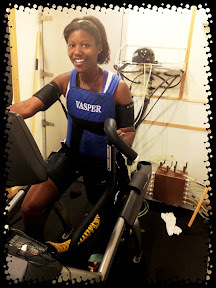 Vasper is a rehab+training system that combines cooling and compression to force the body to produces excessive lactic acid, which in turn, signals the brain to release additional growth hormone. The presence of the additional growth hormone helped my ankle to heal way faster than my surgeon ever expected. Each time I came in for a check up appointment, my doctor would literally drop his jaw in awe at the rate of my recovery. The same doctor that did the nerve-blocking injecting recommended that I see his friend who has been working in Chinese medicine for over 45 years and is now retired but will see people as favors. Well lucky for me, I have friends in high places so I could get in ;-) I've seen the guy 3 times total over the last week and half and by my second visit, my ankle literally looked better than EVER!!! I never thought I would see my ankle as small as he got it ever again. He used a series of treatments to draw the swelling out of my ankle and relieve my pain. At my first visit, he began by doing a foot detox. I thought he was going to electrocute me because with out saying anything, he put a rusty looking copper box in a tub of water, then attached wire to the two crude looking bolts on the copper box, then connect to wire to another little machine. He told me to put my feet in the water. I held my breath as he turned on the little machine... totally prepared to be fried! OKAY... so yeah I'm a little dramatic but I was really nervous!!! In the picture below it looks like "beef-broth" as one of my friends pointed out. HA! 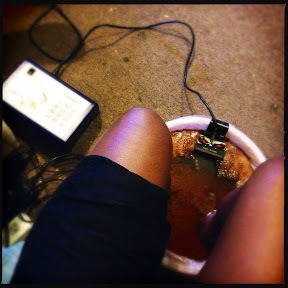 But according to my Chinese medicine man, the water was changing color as the current detoxed my feet and the color came from fats and yeast that were released from my feet. Sounds a lot less appetizing than beef-broth huh?! At the end of each treatment, the doc slathered my foot in his homemade paste of herbs and spices, then wrapped it in plastic wrap and bandages. I had to keep it on for 3 days at a time. Each time I left a little lighter in my wallet and shaking my head, acknowledging my desperation to get healthy enough to compete at my best. But I have to give two thumbs up to Chinese medicine! Everything he did was all-natural and I've truly seen improvement in my past few training sessions. Ok so again, I can't give any medical jargon, but to the best of my understanding, "ionto" basically delivers a topical low-dose cortisone (or medicine of choice) to the area in which the patch is applied via electrical currents. It feels like tiny pin pricks. We originally started using ionto on my ankle last summer to deaden the sensation of the nerve damage where the bones came out of my skin. 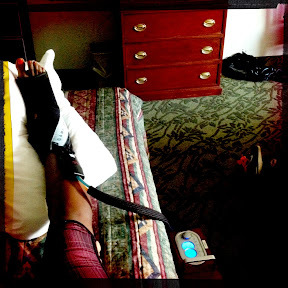 When my injury happened, I was told that I would never regain sensation to the top of my foot and base of ankle. 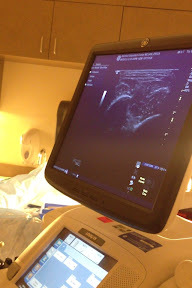 Well, actually the nerves began to repair themselves but the signals were all wrong. When anything brushed against those areas, I used to feel like I was being electrocuted. OUCH!!! So my physical therapists at Agile PT used ionto to help calm those sensations. After about a month of treatment, I was doing much better! We now use ionto to treat various spots around my ankle when it's too painful for manual therapy or to just help the general healing process. This day you and WE (family, friends, fans...) have been waiting for so long has finally arrived I can't wait to see u go out there and do WORK! I really believe in you to make things happen! You're story is beyond amazing you've been thru a lot and never gave up hands down for that now hope your mind is FREE and u will just FLY my best wishes to you. Make that US Team to London you really deserve it.